The Maroons came into Senior Day and their final game of the season sitting on a bubble of qualifications for the NCAA tournament. The South Siders, however, started off slowly, and in just the second minute of play, Wash U knocked an open header from just outside the six-yard box into the back of the frame. Just seven minutes later, the Bears doubled their lead when second-year forward Thomas Hutchings played through a breakaway and struck the ball past second-year Hill Bonin. The Maroons settled down into their usual possession-based style of play, but for the greater part of the first half were unable to create meaningful chances. Chicago, however, was not to be denied, and third-year DJ Weis was determined to make sure this game was not the last for fourth-years Jorge Bilbao, Peter Boxley, David Cohen, and Parker Tikson. The defender got on the end of a free kick from Bilbao and looped an immaculate header into the upper right corner of the net, providing the Maroons with the confidence they needed. Chicago maintained its pace, and just moments into the second half, it broke through Wash U’s back line. The Maroons seemed to score, but the referee failed to play advantage, opting instead to provide the Chicago squad with a penalty kick. Third-year Brenton Desai left no doubt and slotted the ball away in the bottom left corner to tie the game. The Maroons’ possession and subsequent attack persisted throughout the second half as they continued to test the Bears’ back line. They were unable to break through for a third, and the game went to overtime. Chicago was unable to capitalize on its possession until just moments into the second extra period. First-year Matthew Koh played a purely sublime ball through the middle of the Bears defense to third-year Chris Mathis. In on goal against none but the keeper, the mid-fielder made no mistakes, calmly placing the ball past the goaltender, netting the Maroons a victory. Ecstatic, Weis hailed the game as a manifestation of the Maroons’ grit and resilience. 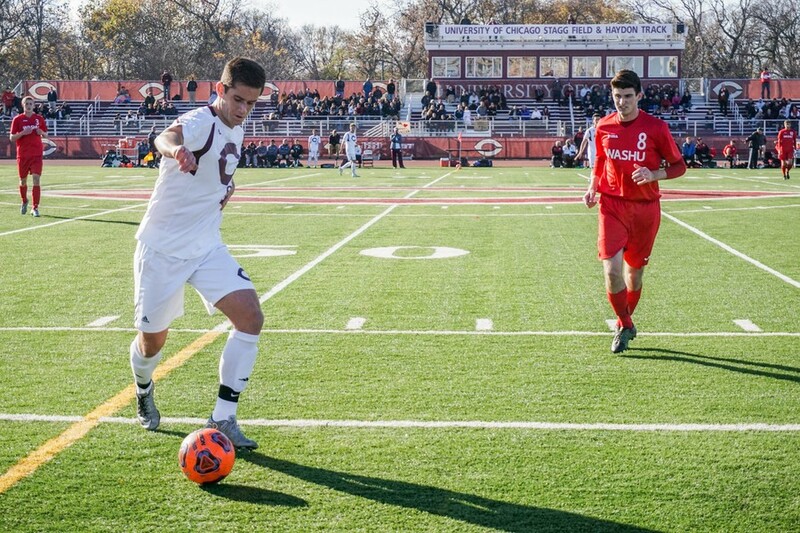 “To fight back from 2–0 down on Senior Day and beat a regional rival 3–2 will be remembered as one of the best games in our program’s history.” The victory boosted the Maroons to an 11–5–2 record and the win over the No. 18 Wash U Bears as well as their recent form of 4–1 provided a compelling case to the NCAA selection committee. On Monday morning, the soccer team gathered to watch the Selection Show. Weis said that, “Saturday’s game showed how much heart, fight, and talent [the team] has.” The selection committee agreed and awarded the Maroons with a berth into the NCAA tournament. They will face a very tough No. 2 Thomas More team in the first round on November 14.